I remember scoffing upon the release of New Kids on the Block’s 1990 single “Games,” which opened with the the lines, “Somebody said somebody wouldn’t last too long / Somebody keeps going strong.” It seemed like a rather defensive missive from a group whose 15 minutes of fame were winding down. Well, they sure showed me! According to a Billboard report, the New Kids’ most recent tour, Total Package, generated over $40 million in revenue. The tour wrapped July 15 in Hollywood, Florida, and featured the Kids performing alongside veteran acts Paula Abdul and Boyz II Men; it moved over half a million tickets across its 48 shows. That means an average of more than 10,000 people per venue showed up to watch these middle-aged men sing songs they’ve been singing since they were actual new kids. Keep in mind, too, that the group has been reunited for almost 10 years at this point. 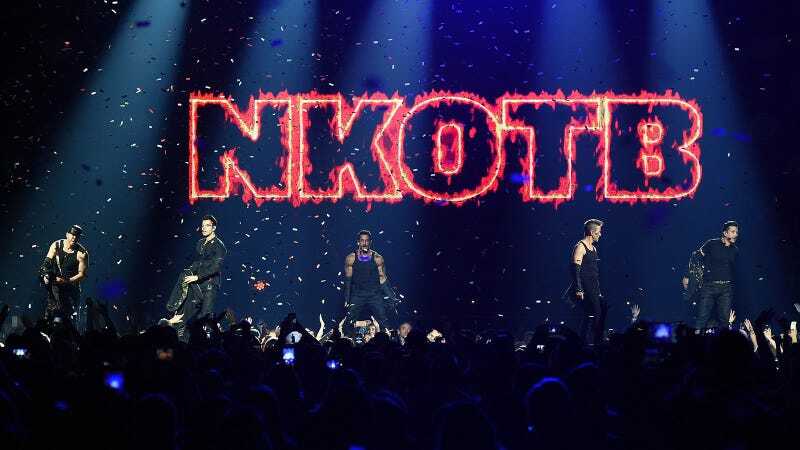 Their 2008-10 tour, New Kids on the Block Live, generated over $35 million in revenue. Their 2011-12 NKOTBSB tour with Backstreet Boys did over $40 million in 2011 alone. Guess what their 2013 tour did? You’re right, $31.4 million. How about 2015? Another $26.1 million. By now the novelty of their reunion has worn off—they’ve been reunited for almost as long as they were together in the first place (1984-1994). People are just really into seeing the New Kids. Over and over. Until someone dies. And even then, they’ll probably still show up until all of us are dead. And then there will be holograms both onstage and in the audience. They used to say that two things will survive the nuclear holocaust: cockroaches and Cher. Well, they didn’t take the remarkable staying power of the New Kids into consideration, now did they? Let this be a lesson: Never let them call you a has-been, or at the very least, don’t believe them if they do. If the New Kids can come back to such roaring success after being a collective punchline for over a decade, it seems like most anyone can.